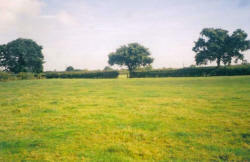 The North Bucks Way was created in 1972 by the Ramblers Association. 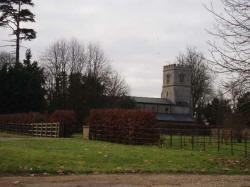 It is 35 miles long, running from the Ridgeway path near Great Kimble to Wolverton on the outskirts of Milton Keynes, where it links up with the Grafton Way on the county boundary with Northamptonshire (the Grafton Way in turn joins the Knightley Way, thus forming a continuous path as far as Badby, near Daventry). 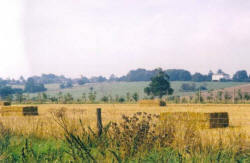 The North Bucks Way starts by descending the steep north slope of the Chiltern hills and then crosses the Vale of Aylesbury. It passes through some picturesque villages such as Great Horwood and Quainton and offers distant views of historic houses such as Waddesdon Manor, Whaddon Hall and Eythrope. It finishes by passing through the modern city of Milton Keynes. Buckinghamshire County Council publishes a leaflet describing the North Bucks Way, available from their web site (see my links page). Most of the historical or other factual data that I quote in my journal is taken from this source. The route is also shown on the OS Explorer map 192. Click here to see a very rough map of the North Bucks Way (but only if you have already read my disclaimer and notes regarding maps). I walked the North Bucks Way in both directions, thus making a 70-mile walk. I did it in 5 days spread over September 2005, walking about 14 miles each day (7 miles in each direction). All the mileages given are very, very approximate and are not to be relied upon. I got them by measuring in thumb lengths on the map and then calculating each day’s distance as a percentage of the whole distance, assuming that this total length was 35 miles. A note about the photographs: I didn't always have a camera with me on this walk, as I didn't decide to create a web site until much later. But I repeated parts of this route when I walked the Aylesbury Ring and the Cross Bucks Way, and so have included photos that I took then. As in all such cases where the photo's were taken at a later date I have added the date to the captions below the photographs. I didn’t enjoy walking the North Bucks Way as much as some of the other walks that I’ve done. Having spent most of the summer walking in the Chiltern hills, most of the North Bucks Way seemed very flat and fairly monotonous in comparison (not that the Chilterns are exactly mountainous!). Nor did there seem to be much of historical or other interest on the route – a few grand houses were passed, such as Waddesdon Manor and Whaddon Hall, but these were only glimpsed at a distance whereas the Chiltern Way went right past several such places (e.g. Grey’s Court, Hampden House). It was also very noticeable that the North Bucks Way did not pass through much woodland - consequently long stretches seemed to go through endless fields without the variety of an occasional path through a wood. The first two days were very enjoyable, but this might be partly due to the excellent weather I had for them. The second day in particular was very good, with a bit more variety in the terrain and in the scenery. The next two days were OK, but nothing special. The final day was pleasant in one or two parts, but basically it’s a walk nobody would do if it wasn’t part of a long-distance path – unless they had a penchant for walking through the residential and industrial areas of a large modern town like Milton Keynes.